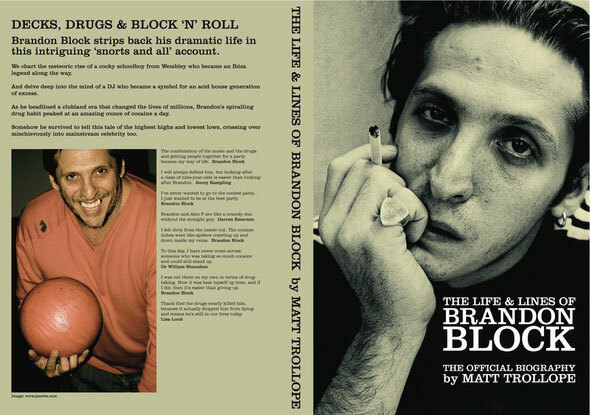 As legendary DJ Brandon Block releases his official biography, read on to get an understanding of why this could be a ‘must read’ for anybody into dance music, house music and the history of clubland from the past 25 years. He was the joker in the pack, the Ibiza ‘nutter’, the party animal who single-handedly created the Caner Of The Year category, was literally lying on his death bed. And despite the chronic situation that he found himself in, with drips attached to his ravaged body as he battled jaundice and tuberculosis, he was still trying his hardest to shovel as much cocaine as possible up that famous hooter of his! The result of a spiralling drug habit which, at its peak, saw him take an ounce of coke a day for almost a year (that’s a mind-boggling 28 grams a day) was his bewildered doctor telling him that he would die within two weeks if he didn’t stop pronto. But that wasn’t going to deter our Brandon. No chance! He pleaded with friends to bring coke to the hospital and they duly, if reluctantly, obliged. If he was on his way out, then he was going out on a high, at least that was the twisted and warped way he looked at it. However, by then he had to take so much of the stuff for it to actually register that it almost defeated the object. Clubland had snorted him up one nostril and blown him out of the other. A haunting shadow of the livewire DJ who leapt on to the house music scene in the late ’80s, Brandon somehow managed to drag himself out of the mire and lived to tell the tale. With his astronomical coke habit - and the complex network of dealers who fuelled it - now fortunately in the past, he is able to look back (through somewhat hazy spectacles) on a 25-year-career which spans the highest highs and lowest lows. His own success and turmoil has weaved in and out of the so-called acid house generation and seen Blocko, like no other DJ, crossover into mainstream celebrity too. Six million Google images of him - compared to 1,500,000 of global superstar Carl Cox - tells its own story. While his pioneering residency with Alex P on the Space terrace in Ibiza in the early ’90s took club life in Ibiza and throughout the world to a whole new dimension. Meanwhile, away from the edgy world of underground dance music, he famously stormed the Brits stage, scrapping with Rolling Stone Ronnie Wood, ending up splashed across the front of the tabloids the next day, with Richard and Judy appealing for his whereabouts later that night! He talked about coke addiction on national television and later celebrity detoxed in Thailand, among a whole host of other reality TV show appearances. He’s presented (for MTV/Channel 4/Kiss 100) and produced (a No 3 UK hit as Blockster). These days his bookings diary is still full and his love of DJing remains, but you’ll also find him down the gym three times a week, or playing badminton with pals. Sure he still likes a drink, but insists he hasn’t touched the white stuff since 1996. In this amazing account we look back at the career of this cheeky- chappie-made-good, a DJ who was there from the very start of the modern-day club movement, who had grafted as a pub and mobile DJ during the mid-80s, a few years later finding himself in a prime position when, like many others, he discovered the drug ecstasy and house music quickly followed a love of disco, soul, jazz funk and hip-hop. This rollercoaster of a ride charts how that underground dance music scene became a national and global phenomenon and how Brandon was intrinsically linked to it all, headlining an era that changed the lives of millions, but also becoming a symbol for its excess. We witness the meteoric rise of a cocky Jewish schoolboy from Wembley who became an Ibiza legend along the way. And how he and his suburban peers led a recklessly hedonistic lifestyle that was the envy of their generation. We see how the odd cheeky half here and there led to more cocaine than you can shake a rolled-up bank note at.